The best chocolate chip cookie on the planet? There’s one way to find out! Break out all the best ingredients you’ve been hoarding and make yourself a batch of these…now! A couple of years ago, I read about a cookie that really sells for $8. Could I create a cookie worth such a price? Oh boy, yes! The secret to this cookie is not gold flecks or a butler to serve it, but fine ingredients and an investment of some time. The recipe demands high quality chocolates, browned butter, toasted almonds, and vanilla paste. Serving them slightly cooled from the oven is a key to the experience. I make a batch of dough, cookie scoop out portions and freeze them. When we are in the mood for these decadent beauties, I pop a couple in the oven while we are eating dinner in order to serve them as a perfectly warm $8 dessert. Mix the sugars and the egg well. Add in the browned butter. Mix in vanilla paste and almond extract. Stir flour, baking soda and salt into the mixture. Fold in the almonds and chocolate pieces. Scoop tablespoon-sized balls using a small ice cream scoop onto the baking sheet. Bake for 8 – 10 minutes. Let the cookies set on the baking sheet for about 3 minutes before removing them to a wire cooling rack. Continue to cool for another two minutes on the wire rack. Serve cookies while still warm. High quality milk chocolate, white chocolate, toasted almonds, browned butter and vanilla paste pack in the flavor. Served warm out of the oven, this cookie adds up to… Irresistible! This week, I read an article about a restaurant which offers a chocolate chip cookie and a glass of flavor-infused milk for $8! The value of this pricey cookie lies in the care with which it is baked and served as well as with the quality of the ingredients. Customers love that this warm-from-the-oven-cookie has a soft, melty chocolate center and crispy edges. 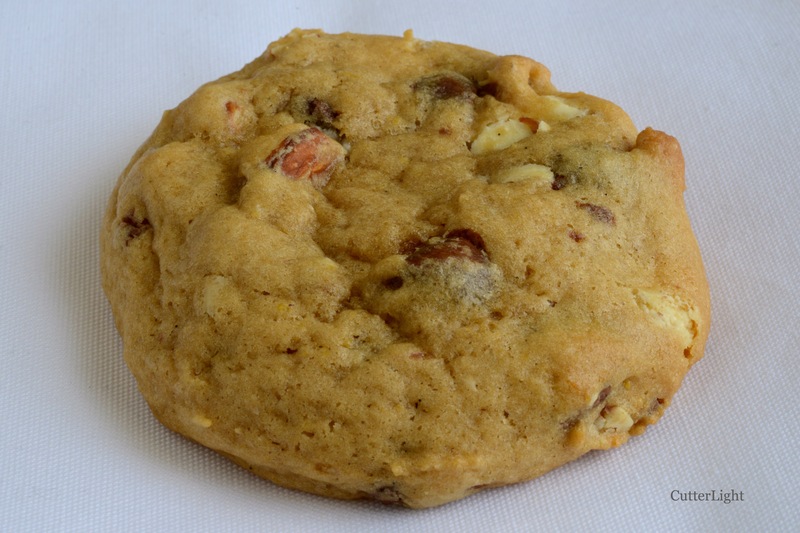 Using the concepts from the article – ingredients should be top notch and the cookie needs to be served individually-baked and warm – I created my own version of a cookie that would deserve an $8 price tag. I love the flavor and texture of nuts in my chocolate chip cookies, so I browned the butter and toasted some chopped almonds to ensure plenty of nutty flavor. I added a dash of almond extract for additional flavor. Traditional chocolate chip cookies use vanilla extract. I substituted the extract with vanilla paste for a richer vanilla flavor. I baked the cookies at a little lower temperature than traditional recipes to allow the cookie to retain its gooeyness a little longer… not that these cookies will last long! I highly recommend you bake only the number of cookies you will immediately serve. The dough will keep in the refrigerator so you can make ’em as you need ’em fresh out of the oven. Both Jack and I agreed that the flavor was amazing. Jack thought the cookies could have been a little bit bigger for the price tag. Feel free to scoop them larger if you agree with Jack!